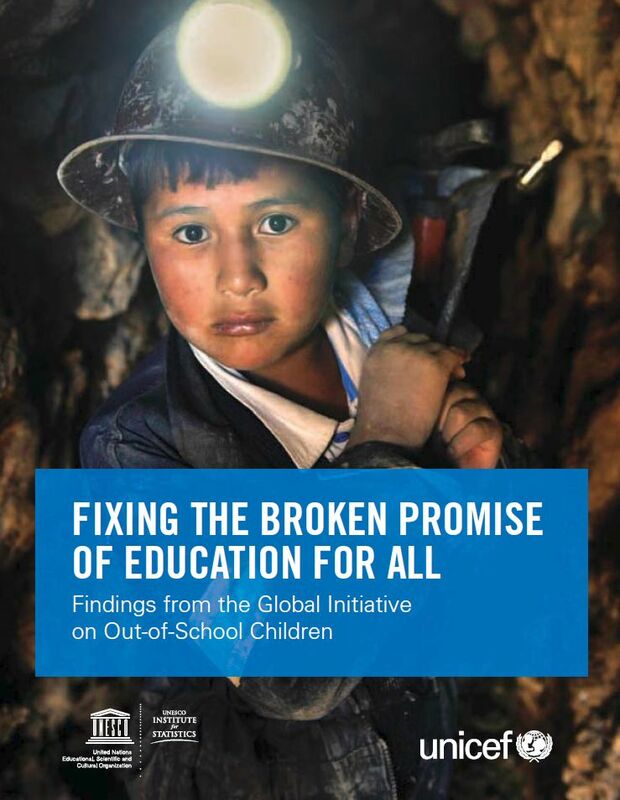 The UNESCO Institute for Statistics (UIS) and UNICEF have jointly published a new report, Fixing the Broken Promise of Education for All: Findings from the Global Initiative on Out-of-School Children. The report, launched at the Education World Forum in London on 19 January 2015, presents the latest global statistics on out-of-school children, examines the barriers faced by marginalized groups and proposes policy solutions, and estimates the cost of universal basic education. The report draws attention to the fact that the world will miss the Education for All goal and Millennium Development Goal of universal primary education by 2015. 58 million children of primary school age (typically 6 to 11 years) and 63 million adolescents of lower secondary school age (typically 12 to 15 years) are still out of school and many of them will never set foot in a classroom. Although the numbers of out-of-school children and adolescents are similar, in relative terms lower-secondary-age adolescents are twice as likely to be out of school as primary-age children, with out-of-school rates of 17% and 9% respectively. Develop comprehensive profiles of excluded children using consistent and innovative statistical methods. Link these profiles to the barriers that lead to exclusion. Identify, promote and implement sound policies that address exclusion. To accompany the publication of the global report, the UIS released an interactive data visualization that illustrates the multiple and overlapping causes of exclusion from education with household survey data from more than 20 countries. UNESCO Institute for Statistics (UIS), and United Nations Children’s Fund (UNICEF). 2015. 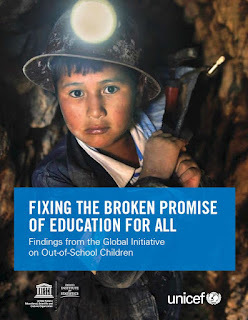 Fixing the Broken Promise of Education for All: Findings from the Global Initiative on Out-of-School Children. Montreal: UIS. Download in PDF format (6.4 MB).